Make no mistake during the End-Times, God will focus His attention on bringing to fulfilment the covenants that He made with Abraham, Isaac, Jacob, and David. Most of Daniel’s visions focus on the Gentile kingdoms in history, and on their rule over the people and land of Israel. 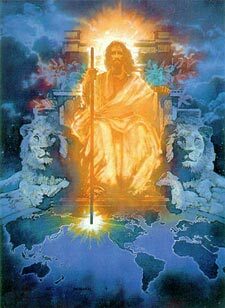 It was revealed to Daniel that the Gentile kingdoms would have dominion over Israel until the time of the end and the coming of their Messiah. He was given understanding that the nation of Israel, and their Land, is going to be embattled and fought over until the end. There will come a time, however, when that season of the Gentiles’ dominion will come to an end; a time when the Land will be given back to the people of Israel; a time when they are going to be restored to the Land. The Bible clearly says that His divine activity will be both “great and terrible” as He zealously works to persuade the peoples of the Gentile nations to turn from their evil ways and accept His “redemptive plan” as it will be expressed in history through the manifestation on earth of the everlasting covenants that He made with Israel. At the same time, God will be working dramatically among Jewish people, and for the nation of Israel, to turn whole-heartedly to Him—accepting the Messiah that He has already sent to make a way for their salvation. We are told that by the end of this age, the surviving Jewish people will believe on and receive Jesus as their Messiah and King! Throughout the New Testament, the prophecies written about the End-Times and the return of Jesus are focused on Israel and other key nations of the Middle East. The Book of Revelation portrays the cities of Babylon and Jerusalem as the two most prominent cities in the End-Times drama. The nations of the Middle East will be the “stage” upon which God completes His activity of redemption in this age and ushers in the next age, which will be a time of renewal and restoration that will affect the whole world. Righteousness is not through our works. It is a gift that we receive and that we live by through faith in Jesus. “God made Him (Jesus) who had no sin to be sin for us, so that in Him we might become the righteousness of God.” (Corinthians 5:21) Awesome! This verse is one of the most “astounding” verses in all of Scripture. It is important to emphasise here that there is only “one-way” of salvation; only one-way to become a Righteous citizen of God’s Kingdom. Sadly much of the apostate church believes Jesus is not the only way to God. This is heresy and leads only to destruction. It is important to pray for the Messianic community, so that they may come to accurately understand God’s heart and God’s Word. This difficult situation, most likely, will only increase in the last days, when the Temple is rebuilt in Jerusalem and a revived Levitical priesthood institutes daily sacrifices and offerings again.